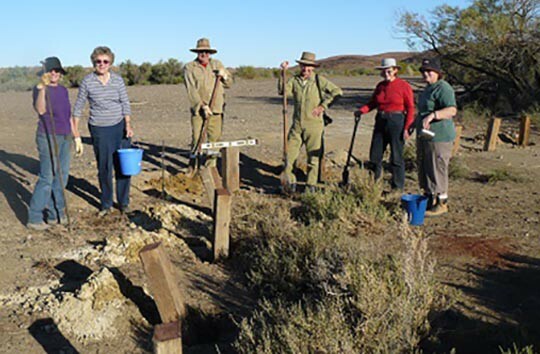 The Friends of Mound Springs (FOMS) was established in 2006, under the umbrella of the South Australian organisation Friends of Parks Inc, to support the conservation and management of the mound springs of Far North South Australia. The Friends group has attracted widely based membership, both locally and interstate, from researchers, government personnel and others with a general interest or involvement in mound springs issues. 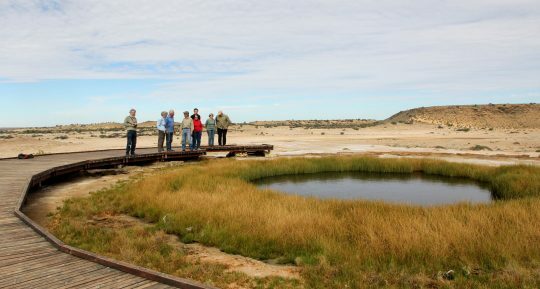 The group provides support for the South Australian Department of Environment, Water and Natural Resources in the management of springs within the Parks network (such as Wabma Kadarbu Mound Springs Conservation Park). The group also has a role in promoting and supporting research of mound springs in general, and in the protection of mound springs outside the parks network in collaboration with pastoral lessees and other interest groups. The group provides a forum for disseminating information and research findings regarding the springs and promotes increased public awareness about the conservation values of the springs. The group has assisted with surveys, walking track construction, installation of signage and protective bollards and general waste removal at the mound springs. Major projects for FOMS have been protective works at the site of the Peake Overland Telegraph station and construction of walking trails and installation of interpretive signage at both the Peake and Strangways Overland Telegraph sites. FOMS has also provided comments on proposed developments and measures that could impact adversely upon the features of the mound springs. A central objective for FOMS is the management of mound springs to ensure that their natural and cultural heritage features are conserved and, in many cases, enhanced. During 2013 – 2016, the group participated in a major project, known as the Desert Jewels Project, with the Department of Environment, Water and Natural Resources, to improve our knowledge about the management of mound springs and to test and promote improved management practices. The annual subscription is $20 for an individual or family. Membership applies on a calendar year basis. If you wish to become a member, please contact us.